According to a gossip rag claims George Clooney is in agonising back pain after his scooter versus car accident last year in Lake Como. George originally hurt his neck and back on the set of Syriana. It caused George pain and a couple of operations his back has never been the same. The rag is talking like George is on deaths door. He was recently seen out and while looking really thin he seemed ok.
We had lots of George Clooney and Amal stories in the last week when suddenly after months hiding they both featured heavily in the press. It reminded me of a Royal tour except without the crowds and for the most part Amal looking ridiculous. 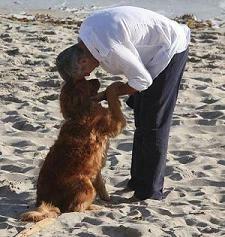 Stories and lot's of pictures in George Clooney Real (Reel) News and George Clooney The Marriage.